Information reaching our desk has it that the West African Examination Council alias WAEC has resolved to conduct the GCE examinations which before now was slated for November-December, two times in a year with effect from 2017. From my own point of view, I think it is the right step in the right direction. This examination before this time was not meant for those who want to secure admission in universities. With this latest development, candidates who where not able to make their results in their school examination can now enroll into any of the two dates as announced by the board. 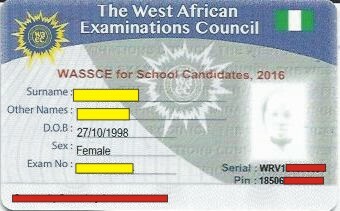 According to the Board Registrar, Dr. Iyi Uwadiae, The West African Senior School Certificate Examination (WASSCE) for private candidates known as WAEC-GCE/November-December GCE will now be conducted in January-February and August September starting from 2017. According to him, this is necessary because various candidates write this examination for various purposes and so this arrangement will give the space to achieve their plans. Asked if the Board is ready with the January-Febraury Plan for next year, he said that the Board has concluded arrangements for next year. So as candidates brace up for JAMB, they should also get themselves ready for GCE within that same period for as many that didn't make theirs in the just concluded May-June exams.